Folks tried to warn me. On the road, people would lean a few inches closer and confide in me, “People are just friendlier within a mile of the old highway. They’ll talk your ear off about everything.” That statement is exceptionally accurate. Environmental regulation, mass incarceration, the rise of national chains, labor unions, paranormal activity, and coming out in your 60s were just a few of the unexpected conversations I had while riding on Route 66 this past week to help #Preserve66 with The National Trust. Our journey began in downtown Chicago, the start of this historic highway. Our trailer twisted and turned with the traffic, winding out of the windy city. For our first day on the road, we stopped at the old Joliet prison in Joliet, Illinois. It has been a part of its community since 1858, and unused since 2002. Much of its striking structure is now deteriorating. Greg Peerbolte, executive director of the Joliet Area Historical Museum, gave us a tour of the grounds and of the sprawling prison itself. As we walked through old Joliet, passing rows of cells in different sizes and varying degrees of dignity, my conversation with Peerbolte evolved from the history of the building to the differences in past prison systems, compared to America’s today. We talked about mass incarceration and recidivism rates, and how historic places like Old Joliet and Eastern State Penitentiary in Philadelphia can play a role in showing the ways our society dealt with incarcerated individuals then and now. It was the first of many unexpected conversations I had while traveling Route 66 that illustrated the way this historic highway can paint a picture of the past, while sparking discussions of the present and the future. 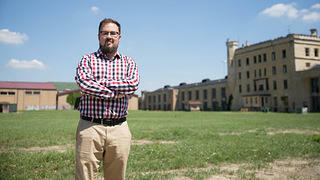 Greg Peerbolte stands in front of old Joliet prison in Illinois. Old Shell gas pumps at Soulsby's Service Station, Mt. Olive, Illinois. 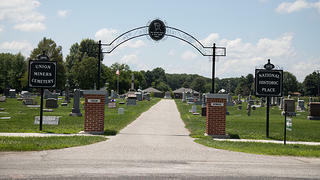 The entrance to Union Miners Cemetery, where activist Mother Jones is buried. Bill Deck stands at the register of his pharmacy, Doc's Soda Fountain, in Girard, Illinois. Another surprising talk came in Mt. Olive, Illinois. We officially stopped at the historic Soulsby Service Station, a Route 66 landmark that has been lovingly restored. But unofficially, local historian Nelson Grman took us to pay our respects at the Union Miners Cemetery, where famed labor activist Mother Jones is buried. The labor movement of the early 20th century and its connection to today hadn’t been on my radar when I began my Route 66 journey. I started to notice a trend, which continued with Bill Deck from Girard, Illinois. He talked to me about the gradual loss of customers his historic family pharmacy experienced when a nearby chain superstore opened up. He felt that his business offered customers something they may not be getting from corporate pharmacies today: good service and good advice. These unexpected conversations kept happening from St. Louis into the Ozarks. Of course, they always started with something like, “Where ya’ll from?”, but more often than not, small talk turned into a real discussion between complete strangers. I’d like to think it’s just a part of the culture of The Mother Road. Join the National Trust in supporting a National Historic Trail designation for Route 66. Together, we can help revitalize it as an iconic and evolving piece of Americana for generations to come.